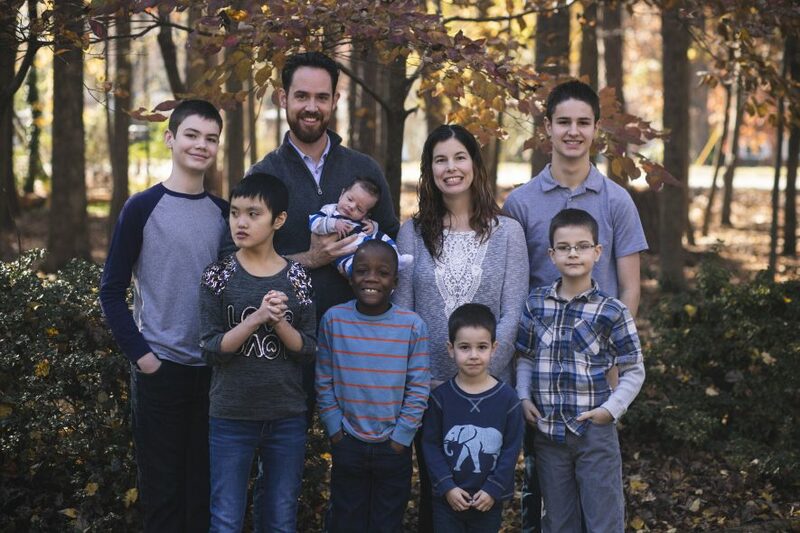 Since we are going to have our adoption celebration this Sunday at church I though I would recount the story of how Elizabeth came to be in our family. Five years ago I read a book about praying specifically for what you want. At that point, and for many years before that, my greatest desire was to have a little girl. My boys were wonderful and we were so blessed to have two healthy boys at that point, but my heart wanted a little girl. So, for six months I prayed for a little girl. We had decided to try to have kid #3 so during that time I was praying daily for my little girl. One day during my prayer time God spoke to me. Not like in a voice I could hear but in my heart I knew it was Him speaking. He said, “you will get your little girl but it will be a while”. I was overjoyed but knowing God as I do, “a while” is usually a long time, so I prepared myself for a long wait. The next month I found out I was expecting! I was surprised that God had done what I asked so quickly! Hahaha. 15 weeks into the pregnancy I went in for a routine doctor check up and found out the baby had died. I was devastated. I didn’t know what God was doing. The doctor’s couldn’t find a cause but assured me if we tried again we had a good chance of not having another miscarriage since we had two little guys already with no issues. So, we waited until I was emotionally ready to deal with pregnancy and we tried again. It wasn’t long before we were expecting. We were excited but also scared of the what if’s. We were cautiously optimistic. At our first appointment the baby wasn’t growing as it should be. We prepared ourselves for the worst and a few weeks later the worst came. I told Glenn during those weeks of waiting that if we weren’t successful in this pregnancy I couldn’t get pregnant again. I just couldn’t deal with anymore loss. So, after we had our second miscarriage we decided to pursue adoption, something we had always talked about doing. We did our paperwork and within 9 months we got the call. I was convinced this would be our daughter, God had promised, right? Nope, it was a boy. God assured me he was to join our family and that he had not forgotten His promise to me. Shortly after we brought Joshua home from the hospital we found out we were pregnant again, much to our surprise. I was terrified. I cried when I found out because I just couldn’t go through another loss. I was scared through the whole pregnancy and even after he was born. And of course it was a he. What was God doing? Where was this girl he promised? When Elijah was 8 months old I was praying while doing a late night feeding and God spoke to me again about our daughter. He said, “it’s time to go get your girl and her name is Elizabeth”. I was shocked! Really God? Right now? I had a 7-year-old, a 5-year-old, a 1-year-old and an 8 month old. Not my idea of good timing. I wrestled with it for a while, a few months. Finally, I mentioned it to Glenn. His reaction was similar to mine. We both prayed about it and then God began yelling at us. Not audibly of course, but everywhere we turned adoption was mentioned. Books, movies, TV, radio, in person. Everywhere! We knew it was what we were supposed to do. So, a month before our youngest turned 1 we signed up. At that exact time a little girl’s file was being transferred to another agency. The agency we signed up with, Bethany, had a file of a little girl who was 9 years old and had been on their list of waiting kids for 4 years. Hong Kong decided to transfer her file to another agency here in the US to try to find her a family since Bethany had not success. Bethany was not informed of this change. We were just beginning our paperwork and deciding what country to go toward, and God told us to go to Hong Kong. That was not what we wanted to do. We wanted to go to Columbia. We speak spanish, it made perfect sense. But God told us to go to Hong Kong. Hong Kong only adopts children with special needs, and not just minor needs, but major needs. Not what we were looking for. How could we handle that with four young boys? We prayed about it and God further confirmed Hong Kong for us. So, we signed up. We began looking at the profiles of children available for adoption in Hong Kong. We though we would adopt a little girl age 4 or under, with Down Syndrome. Wrong again. We tried to get matched with a few of these girls but it didn’t work out. I was getting discouraged wondering if we would ever find our daughter. We went on a beach vacation in July and while there I was praying about our situation. God told me our daughter was on the waiting child list but I had to be more open. So, I began looking at older girls and ones with different needs. Then I saw Elizabeth’s file. She was 9 years old at the time, and while she didn’t have Down Syndrome she has similar needs. So, I asked for her whole file. The agency said they didn’t have it and it was then they realized she had been taken off their list and put onto another agency in Hong Kong. As only God can work things out, it just so happened that our agency was in negotiations to partner with this agency who had been given Elizabeth’s file. So, we were able to pursue her adoption after praying about it and realizing she was the child God had for us. That was a year ago in July and since then we have continued on in pursuing her adoption. Wading through paperwork and getting to know this beautiful little girl through pictures and reports. We are thrilled to be so close to finally meeting our daughter and completing this five-year journey of finding her. Our journey to Elizabeth has been a long one, but God fulfills his promises. It wasn’t until almost a year later after God had given me the name of “Elizabeth” that I looked up the meaning of the name, it means “God’s oath”. That was so cool to me! God is fulfilling his oath to us through this little girl. Ruth, Elizabeth has such a beautiful story. I can’t wait for the next chapter! What a blessing the Holy Spirit is! This reminds me of a word I received last week; If your desires align with what God desires for you, there is no one, no thing, nor no devil in hell that can keep it from you. So many of us need to hear & receive this reassurance. Thank you for sharing!